2012 Lionel #17 Nutcracker Loco, Tender, Baggage Coach Set. QX9011 - $20.00 : Olson Hobbies, Welcome To The Train Page! 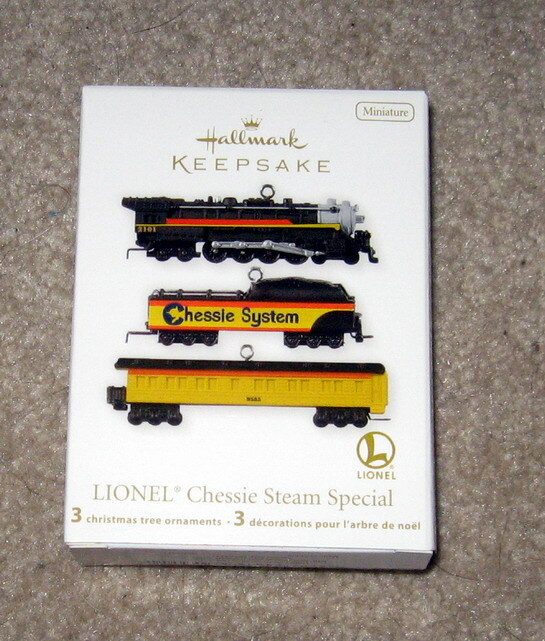 2012 Lionel Miniature Chessie Steam Set. Mint Condition 2012, Lionel Chessie Steam Special Set. Celebrating the 150th birthday of its parent railroad (The Baltimore & Ohio) the Chessie Steam Special barnstormed along the rails of the entire system in 1977 drawing large crowds for one last look at steam-era railroading in America. Introduced in the 1991 Lionel catalog, the stunning locomotive and cars are easily recognized by their bright colors and iconic kitten design. This miniature train set includes the Chessie Steam Loco Tender, and passenger car. Stock number QXM9011. All pieces are handcrafted, wheels turn manually, crafted Die Cast Metal.